Coupon code below! GIVEAWAY ENDED! Congratulations Gwen & Jennifer! A few years ago I was introduced to attachment parenting. I personally thought it seemed like an extreme idea but I think that was because of my limited knowledge on the actual ideas. I originally thought that it was a theory that parents and their babies/children should not be separated from one another. That by being held at all times and by co-sleeping that the child would somehow gain some sense of security. Now with my second child I am starting to understand that it’s much deeper than that. It’s not just about holding your child. It’s more about living a more natural family lifestyle including such values as breastfeeding, natural health, co-sleeping, baby wearing and homeschooling. Being an attachment parent doesn’t mean that you have to accept all of these values either. I didn’t realize that I was actually following most of the principles of attachment or natural parenting. We cloth diaper, breastfeed, make homemade (and organic) baby food, co-sleep on occasion, and wear our baby. I did most of these withmy first son over 6 years ago. The two newest practices are the cloth diapers and the baby wearing. Both of which are actually very ancient in origin. Wearing your baby has been done for thousands of years by many cultures including the ancient Chinese and Egyptians. I had a carrier similar to the Baby Bjorn with my son but it wasn’t easy to use. It had clips and you couldn’t put it on without someone helping you. I remember trying to carry my son through the airport as a child and struggling to get through security because I had to remove him from the carrier with very little help. I was totally discouraged and we didn’t use it much after that. So with my daughter I decided to give it another try. This time I was going to try the Hotsling. My husband actually thought I was crazy for spending that much money on a sling because he remembers the experience with our other carrier. I now have 2 Hotslings and I’m hooked. The funny thing is, so is my husband, my mom, and my sitter! As a newborn it was great for breastfeeding in public because it gave the baby a private place to feed. As she’s gotten older (now 6mo) we’ve worn it differently (there are many different ways to wear the pouch slings) and it’s great for hip holding. The best thing about the slings is that it usually puts Lil’ B to sleep in a matter of minutes. I can work, do dishes, vacuum, and more; all while keeping her close to me. Recently, as some of you may know, I’ve become addicted to Twitter and the Monday night #clothdiaper chats. During one of my first chats I heard everyone talking about baby wearing and I HAD to learn more. Luckily for me there was a baby wearing chat a few days later and I learned SO much! I didn’t realize how many different styles of carriers there were. 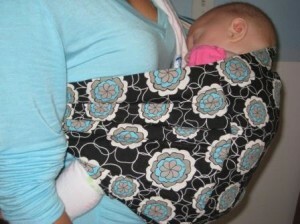 Mei Tai’s, pouch slings, ring slings, structured, unstructured, Moby’s, Ergo’s, etc. Oh boy, am I in trouble! I want to try them all! One of the companies I became familiar with was Dittany Baby. This is an online retailer who specializes in pouch slings, Mei Tai’s, and Skidpants/Legwarmers. (Oh yeah, another one of my addictions is baby leg warmers! I love them!!!) Here is an interview with the founder and owner of Dittany Baby that I conducted the other day. Keep reading because they have offered 2 lucky readers a special giveaway and coupon code! The Eco Chic: Can you describe where the name Dittany Baby came from? Dittany: I had to come up with a name that meant something to me, I’m quirky like that! I thought about different combinations of names pertaining to my family but nothing clicked with me. There are so many GREAT names out there and I wanted to create a name that stood out and could really fit with whatever we threw at it weather it was baby products or branching out into other lines and products. I pulled up a herb/flower list on Google and just started down the list and my eye caught Dittany of Crete. I began to read the story of ancient shepherds living on the island of Crete finding two sets of sheep. One set that had been wounded by a nearby battle, shot with arrows and dead and another set who had been found eating this purple flower and whose wounds were healing. Dittany of Crete is even mentioned in Homer’s The Iliad. As I read further I found out that through the centuries one of the main uses was to ease the birthing process and also externally as a salve on a wound. At that time we had two products, the slings and skidpants. To me the name fit so perfectly with what I was trying to accomplish. I put the skidpants on my son’s legs as he learned to crawl to protect him from the blisters he was getting by dragging his legs and I had fallen in love with slings and all of the soothing benefits that baby wearing can provide. I was sold! That was the name! The Eco Chic: With all the baby products out there why do you focus on SkidPants/Legwarmers and baby carriers? Dittany: As a manufacturer I believe in making something GREAT! A product and a company that is EVERYTHING that I would want it to be! Until that is accomplished I wouldn’t allow us to move on to other things. Last May we brought all of the skidpantproduction here to the US and that was a very important step for me. We’ve spent the year getting everything else in place and creating a smooth flowing operation. So now it’s time to watch out! We have some really exciting things on the horizon with a release of a new product called “The Baby Lua” along with our goal to have our first brick and mortar store opened by Mothers day of 2010. The Eco Chic: What age babies/children can wear your SkidPants/Legwarmers? 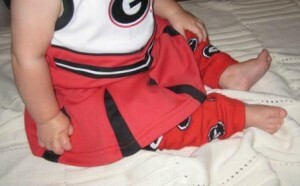 Dittany: My son wore them as early as 8 weeks but I had to do the 80’s tuck and roll like we did with jeans. They are longer than others on the market being 15 inches in length and they are very stretchy so as to not cut into the thigh. That being said we’ve had babies to adults wearing them. The Eco Chic: Why did you begin to ‘wear’ your child? What are some of the benefits of baby wearing? Dittany: I was a naive first time mom. I’d never heard of baby wearing and I found it on the internet when I was trying to find another way to take my 8 month old to a historical market in DC without using a stroller. From there I found www.thebabywearer.com which is an invaluable resource of information. The next day after making my first sling I walked 15 blocks in DC with flip-flops on and carrying a BIG baby and I felt GREAT! I was convinced and that was even before reading about all the other wonderful benefits like the bonding between wearer and baby, the health benefits for the baby’s spine, legs digestion and that’s not even talking about the wearers back! The Eco Chic: What is your favorite style of baby carrier, and why? Dittany: That’s a hard question and it really depends on the circumstances and their age. Dittany Baby had a luxury Mei Tai that had spa minky fleece and that was my favorite when my second son was a newborn. As they grow older from about 4 months on I am an avid pouch sling wearer…not sure why but that is just the way it worked for me. The Eco Chic: You offer a collegiate line of SkidPants. Any plans on collegiate carriers or other collegiate items? Dittany: Yes, as a HUGE college football fan I was so excited to introduce our officially licensed collegiate warmers. They have been a huge hit and there are some schools that as soon as we re-knit they are gone within a matter of days. We are about to launch www.collegiatebaby.comthat will have our warmers and other coordinating items like beanies, onesies, etc. As far as collegiate slings they are in the works. It takes a lot to get things licensed and approved so we’re working on it. The Eco Chic: From one college football fan to another, what is your favorite team? Dittany: If you ask me during the week I’d tell you all the ones we have in stock. I love them all and love designing them especially our new argyles that are coming out this fall. However, on a Saturday between September and January that’s a different story and for the love of my awesome customers and the fans of our bitter rivalry I’m going keep that a secret! 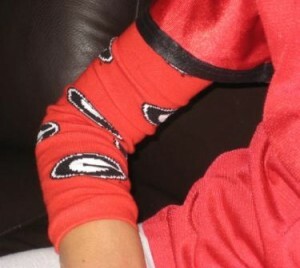 I wanted to thank Dittany Baby for allowing me to s ample their Iris Reversible Pouch Sling and UGA (Go DAWGS!!) legwarmers. Their products are very high quality and I’m sold! A few great features about their pouch slings: light weight, reversible, and come with a great carrying pouch. The legwarmers are very versatile. They are longer in length than the Baby Legs I’ve purchased at Target which will allow Lil’ B to wear them even as a toddler and preschooler. In addition, I’m going to get my own pair to wear as arm warmers! Fall football games can be hot during the day and cool at night so these would come in very handy under my jersey. To enter to win a pouch sling and legwarmer set from Dittany Baby you must complete #1 below. In addition, you may earn extra entries by doing any of the additional items. You must complete step #1 though. 2. Become a Fan of both Dittany Baby and The Eco Chic on Facebook. Leave a comment below and let me know you are a Fan. Good for one extra entry. 3. Follow both @dittany and @theecochic on Twitter. Leave a comment below and let me know your user name after you have followed us. Good for one extra entry. 4. Add my Eco-Summer Blog Party button or The Eco Chic button to your blog or website. (Code is located on the upper right sidebar) Please leave a comment with a link to your blog/site. Good for one extra entry. 5. Write a blog about the Eco-Summer Blog Party & Dittany Baby. Please leave a link to your blog in the comment section. Good for one extra entry. 6. Tweet the following message “Learn the benefits of baby wearing and Win a Pouch Sling and Legwarmer Set from @dittany and @theecochic www.backtocalley.com #giveaway” It is important to include all of that information so I can track the tweets! Good for one extra entry per tweet; maximum of 2 tweets per day until the end of the contest. 7. Subscribe to have The Eco Chic delivered to your email inbox using the Feedburner subscriber located at the top right. Good for one extra entry upon confirmation of subscription. Please verify your subscription. You can earn a possibility of 12 entries if you follow all of the options!ENTER EXTRA COMMENTS HERE!